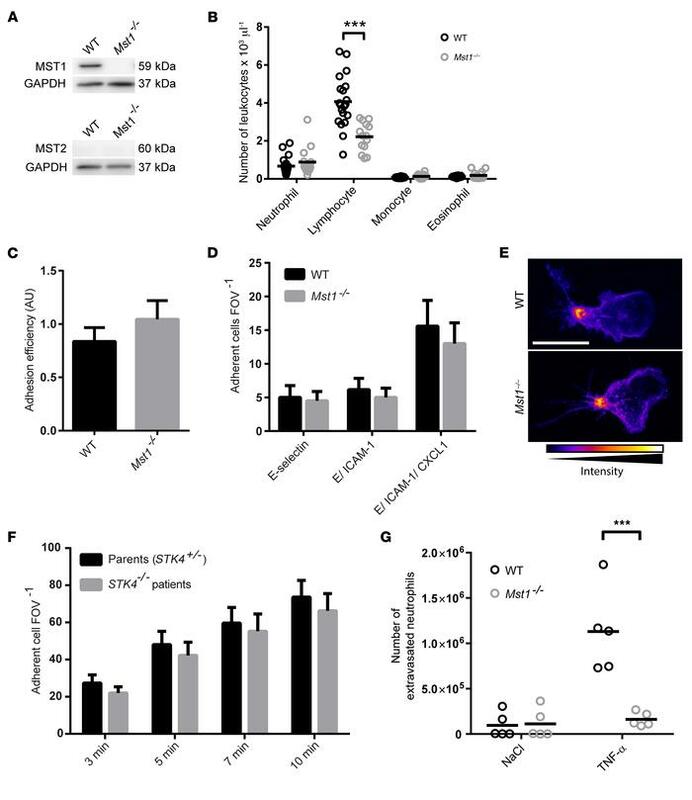 MST1 is dispensable for neutrophil adhesion in humans and mice, but critical for neutrophil extravasation into inflamed peritoneum. (A) MST1 and MST2 protein levels of WT and Mst1–/– neutrophils. GAPDH served as loading control (n = 3). (B) Differential blood counts of WT (n = 20) and Mst1–/– mice (n = 14) (scatter plot with mean, ***P < 0.001, 2-way ANOVA, Sidak’s multiple comparisons test). (C) Neutrophil adhesion efficiency (arbitrary units) in cremaster muscle venules of WT and Mst1–/– mice, 2 hours after intrascrotal injection of TNF-α (n = 5, mean ± SEM, NS, unpaired t test). (D) Number of adherent leukocytes per field of view (FOV) in microflow chambers coated with E-selectin, E-selectin/ICAM-1, or E-selectin/ICAM-1/CXCL1 (n = 3, mean ± SEM, NS, 2-way ANOVA, Sidak’s multiple comparisons test). (E) LFA-1 clustering of WT or Mst1–/– cells labeled with anti–LFA-1 antibody conjugated with Alexa 546 (fluorescence intensity scale). Whole blood was perfused through microflow chambers coated with E-selectin, ICAM-1, and CXCL1 (Supplemental Videos 1 and 2) (n = 3 mice, 1 representative picture is shown). Scale bar: 10 μm. (F) Number of adherent neutrophils per field of view from 2 patients with STK4 deficiency and their heterozygous parents was calculated over time in flow chambers coated with E-selectin/ICAM-1/CXCL8 (n = 2, chambers ≥2, mean ± SEM). (G) Total number of extravasated neutrophils in the peritoneal lavage 2 hours after i.p. injection of NaCl or TNF-α in WT and Mst1–/– mice (n = 5, scatter plot with mean, ***P < 0.001, 2-way ANOVA, Tukey’s multiple comparisons test).